In the eastern part of Co. Donegal many of its inhabitants like to be referred to as Lagganers, in recognition of their Ulster Scots identity and in memory of the successful role in 17th century Irish history played by an army of their ancestors that proudly carried the name. The current inheritors of the title remain a resilient and dignified people and it is with the greatest of regrets that it must be noted that one of its finest exponents of such Lagganer qualities, William Gerald Wallace of Manorcunningham, has recently passed away. A native Lagganer, Gerry Wallace spent most of his long and distinguished life in the very heartland of the area between the Swilly and the Foyle and his devotion to his native soil and its people was always evident. A family man, scholar, teacher, Presbyterian of the traditional order, talented chorister, unapologetic Loyalist, orator and efficient organiser. Gerry was above all else a modest Donegalman of a special breed that has almost disappeared and I can now only speculate that he might be a trifle surprised by this eulogy. Gerry and his twin brother, Ernest, were born during the harsh years between the 2 Great Wars and at a time when his kith and kin were still endeavouring to cope with the political change in his native country. It is an abiding tribute to Gerry that borders of any nature did not deter him from his missions in life. The Wallace boys were educated at Foyle College and, after matriculating as freshmen at Magee University, they read History and Geography at Trinity College, Dublin. After graduation they both embarked on teaching careers in the North West that lasted for practically all of the second half of the last century. Gerry commenced teaching in the newly established Clondermott Secondary in the Waterside, and then moved nearer home when Templemore Secondary School was established near to the Donegal border and which originally catered for many pupils from his home territory. His long service at Templemore, where he commanded the post of Vice Principal for over 3 decades, witnessed the almost complete demographic change in the city. He readily accommodated this change despite the repeated intrusion of civil unrest into his domain at Northland Road. He, was, however, frequently outraged by the sectarian murder of many of his former pupils and members of their families and he provided much needed counsel and sympathy during those dark days. He remained a highly respected teacher in Londonderry until his retirement in the mid 1990’s. His unique ability to communicate effectively with all of his pupils and colleagues – regardless of their political and religious inclinations – was acknowledged then and by the many former pupils and teachers who attended his funeral on the Wednesday before Easter. Gerry was a Presbyterian of muscle and mettle; he served his church in Ray loyally in its many offices for several decades and his contributions; and that of his faithful brother, Ernest, was officially recognised by the current Moderator of the General Assembly during his very recent visitation to celebrate the wonderful refurbishment of this historic Kirk. In his homily at the committal, his close friend, Rev Joe Fell of Ebrington Presbyterian Church, referred frequently to Gerry’s commitment to the traditional liberal tenets if Presbyterian and to his desire to preserve its unique heritage. His dedication to all aspects of orderly Loyalism is well known throughout Ulster and further afield. Gerry Wallace belonged to that special group of East Donegalmen, who would under no circumstances renounce their loyalty to their monarch, faith and heritage, despite the obvious territorial and other difficulties. During the particularly grim days of the 1970’s and 80’s, Gerry, along with the late R J Fleming and George Dunn of St Johnston, Alex Lindsay of Manor and Willie Buchanan of Convoy and a few stalwarts still alive, ensured that their people could observe their traditional culture- by parading, attending church and generally behaving in a dignified manner. 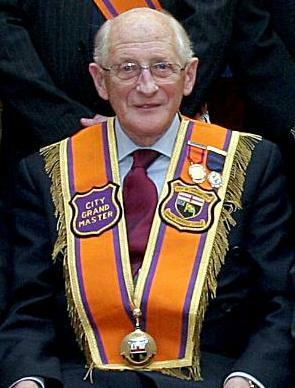 At a particular sensitive time for Orangeism in the North West Gerry was elected into the office of City of Londonderry Grand Master and, with diplomacy and determination, he determined that the institution would have a secure future, He negotiated effectively, assisted no doubt, by the ironic fact that he was at times, dealing with ex pupils at every level. His legacy is much appreciated by his excellent friend, the current Grand Master, Victor Wray. Gerry was a lifelong member of the Royal Black Institution, commanding for some years the highest office as County Londonderry Grand Master. He served for over half a century in the office of secretary of both Manorcunningham Murray Club of the Apprentice Boys of Derry and with his own private lodge-Manorcunningham Temperance LOL1117. His exceptional Loyalism is virtually without parallel and the current strength of all the loyal orders in East Donegal and Londonderry owe much to him. Donegal, he was a former President of Londonderry PROBUS, the association of retired professionals. A keen historian, he delivered many papers on aspects of local history, but he was, of course, particularly interested in the Laggan Army of the 1940’s and the Williamite Wars of 1688-92. Unsurprisingly he was one of the motivating forces behind the rejuvenation of Manorcunningham Pipe Band, serving many offices on the committee of this well regarded top grade competition marching band. “Alto Vista” – his beautiful home high up on the hill among its fine gardens, overlooking the Swilly and the Big Isle is further testimony to his industry and patience. He is survived by his wife, Myrtle, his son Robert, and his daughter Julie and her family and by his dear brother, Ernest, who bears a close resemblance to him in every way. The very large representative attendance at his service in the Ray Presbyterian Church was a definite indication of the strength of communal sympathy and respect for Gerry and the Wallace family. One anecdote serves to sum up in a nutshell his true spirit. In my company a visiting dignitary sympathised with Gerry on his supposed plight as an inhabitant of one of Ulster’s 3 “Lost” Counties i.e. : not included in the political settlement of the 1920s that brought Northern Ireland into existence. Gerry responded in his normal dignified way with the comment “You can only be lost if you do not want to be found”. I do not, for a moment, believe that the late Gerald Wallace of Manorcunningham was lost very often. He was a true Lagganer whom I am proud to have known as a colleague, a fellow brother in the Apprentice Boys, and a genuine friend and I humble salute his memory. "It comes with great sadness to hear of the the death of Bro Gerald Wallace. Gerald was a great personal friend of my family and myself, he was a gentleman to everyone and will be sadly missed by all the loyal orders for his knowledge and wisdom."